The Lost World of Cave Girl! This year marks the one hundredth anniversary of a banner year in the literature of fantasy and adventure. Nineteen twelve was particularly significant in the development of the little genre of lost worlds, a genre inhabited by Cave Girl and countless other fictional characters. 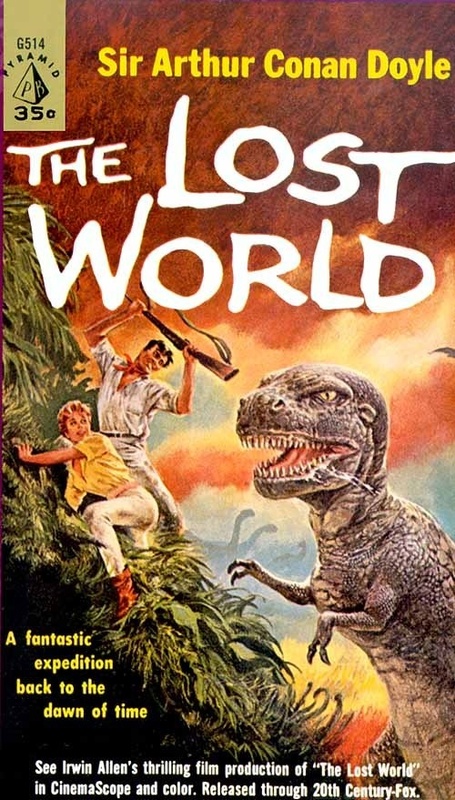 The lost world genre is no doubt named for Arthur Conan Doyle's novel, The Lost World, serialized in The Strand Magazine between April and November 1912 and published in hardback before the year was out. 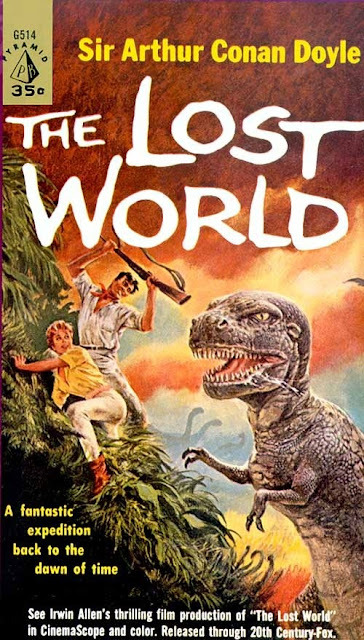 The Lost World set the pattern for all lost worlds to come: intrepid explorers (led in this case by Professor Challenger) mount an expedition to a hidden and almost inaccessible land where they find prehistoric creatures and strange races of men. We have all enjoyed books, movies, and TV shows that fit the pattern: King Kong (film, 1933), Robert Moore Williams' Jongor series (fiction, 1940-1951), The Valley of Gwangi (film, 1969) and Land of the Lost (television, 1974-1977) are just a few examples. Works as varied as Herland (1915), At the Mountains of Madness (1931), Lost Horizon (1933), The Island at the Top of the World (1974), Jurassic Park (1993), Lost (2004-2010), and Ka-Zar and the Savage Land (Marvel Comics) draw on the conventions of a genre pioneered in the original Lost World. Arthur Conan Doyle (1859-1930) may have been pioneer, but no writer exploited the lost worlds genre to a greater extent than Edgar Rice Burroughs (1875-1950), nor in more ways. A restless jack-of-all-trades, Burroughs set off his writing career with a bang in 1912, first with John Carter of Mars, then with an even greater success, Tarzan of the Apes. The saga of John Carter began in February 1912 in the pages of The All-Story with a serial entitled "Under the Moons of Mars," later published in hardback as A Princess of Mars (1917). 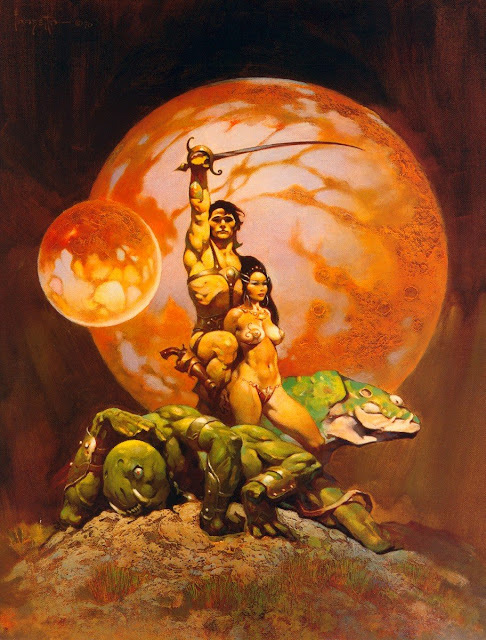 Although it's considered a work of planetary romance or science fantasy, the collected John Carter can be interpreted as another variation on the lost worlds genre, complete with strange creatures, varied races of men, and decaying civilizations. By Burroughs' time, of course, few options remained for locating lost worlds on Earth, a world that was mostly found. Whether he intended to or not, Burroughs expanded the possibilities of lost worlds by locating them in outer space. His Barsoom was a forerunner to the myriad lost worlds of science fiction. Edgar Rice Burroughs completed his annus mirabilis with "Tarzan of the Apes," published in The All-Story in October 1912 and in a hardbound edition two years later. Eventually running to twenty-two volumes published in Burroughs' lifetime, the story of Tarzan brought together all the elements of the lost worlds genre: the modern man thrust into a primitive environment; conversely, the primitive man introduced into the modern world; preternaturally intelligent animals; races of men of every size, shape, color, description, and culture; lost cities; hidden valleys; forgotten civilizations; dinosaurs and other strange creatures; a hollow earth; and on and on. Tarzan remains one of the most recognizable characters the world over. The influence of Tarzan and his creator are incalculable, even today. Three works--The Lost World, "Under the Moons of Mars," and "Tarzan of the Apes," all from 1912--brought together the pieces of the lost world genre. Everything that followed--including the comic book stories of Cave Girl--has been a variation on a theme composed a century ago by two authors, Arthur Conan Doyle and Edgar Rice Burroughs. Published in 1912, The Lost World by Arthur Conan Doyle has been adapted to the movies many times, and why not? After all, it brings together people and dinosaurs in a way the real world has never seen fit to do. Here's a paperback tie-in to the 1960 version, directed by Irwin Allen. Before Frazetta, there was J. Allen St. John, and before him, Frank Schoonover. Great American illustrators have been drawn to the works of Edgar Rice Burroughs and for good reason. Whatever he may have lacked in literary ability, Burroughs possessed a powerful and fertile imagination. 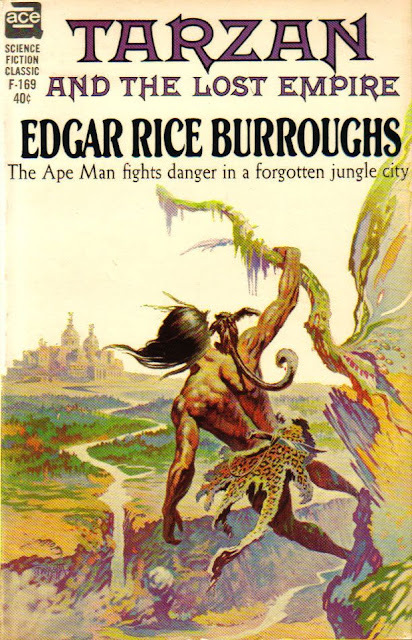 Two covers with similar themes: From a distance, Tarzan looks upon a lost city. I don't know the artist for the first of these two covers, but Frank Frazetta, in his watercolor period, created the second. Frazetta will figure pretty prominently in the continued secret origin of Cave Girl. 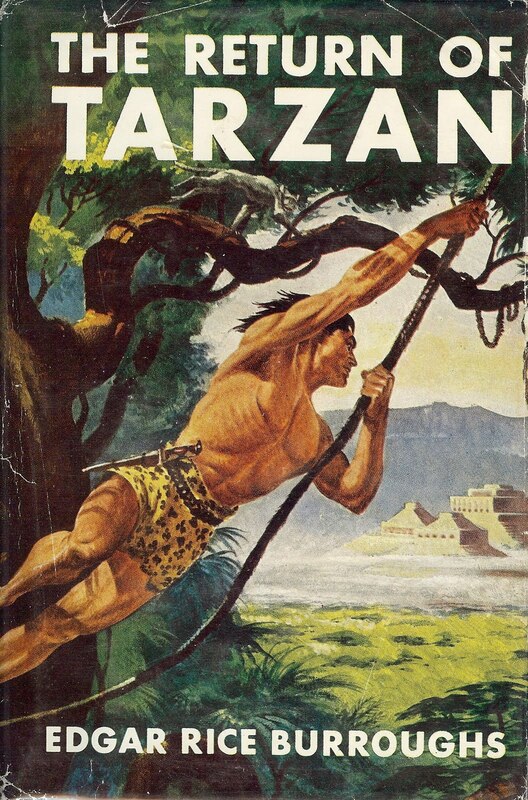 The artist for the dust jacket of THE RETURN OF TARZAN is Charles Edmund Monroe, Jr. He painted it in 1948 using egg tempera. Thank you for the information. Egg tempera would have been an unusual medium for what is essentially a pulp illustration.